The most current data can be accessed via the Global Surface Temperature Anomalies page. In the atmosphere, 500-millibar height pressure anomalies correlate well with temperatures at the Earth's surface. The average position of the upper-level ridges of high pressure and troughs of low pressure—depicted by positive and negative 500-millibar height anomalies on the March 2016—is generally reflected by areas of positive and negative temperature anomalies at the surface, respectively. The combined average temperature over global land and ocean surfaces for March 2016 was the highest for this month in the 1880–2016 record, at 1.22°C (2.20°F) above the 20th century average of 12.7°C (54.9°F). This surpassed the previous record set in 2015 by 0.32°C / (0.58°F), and marks the highest monthly temperature departure among all 1,635 months on record, surpassing the previous all-time record set just last month by 0.01°C (0.02°F). Overall, the nine highest monthly temperature departures in the record have all occurred in the past nine months. March 2016 also marks the 11th consecutive month a monthly global temperature record has been broken, the longest such streak in NOAA's 137 years of record keeping. The average global temperature across land surfaces was 2.33°C (4.19°F) above the 20th century average of 3.2°C (37.8°F), the highest March temperature on record, surpassing the previous March record set in 2008 by 0.43°C (0.77°F) and surpassing the all-time single-month record set last month by 0.02°C (0.04°F) . Most of Earth's land surfaces were warmer than average or much warmer than average, according to the Land & Ocean Temperature Percentiles map above, with record warmth notable across eastern Brazil, most of eastern and central Africa, much of southeastern Asia, and large portions of northern and eastern Australia. Most of northwestern Canada and Alaska, along with vast regions of northern and western Asia, observed temperatures at least 3°C (5°F) above their 1981–2010 average. Far northeastern Canada, parts of northwestern Africa, and a region of south central South America were cooler than average. The mean March temperature for Australia was the highest in the country's 107-year period of record, at 1.70°C (3.06°F) higher than the 1961–1990 average. The warmth was widespread. All states and territories observed temperatures among their eight highest for March, with New South Wales and Victoria record warm. The nationally-averaged March minimum temperature departure was also record high (+1.97°C / +3.55°F), while the average maximum temperature was seventh highest (+1.42°C / +2.56°F). New Zealand reported its sixth warmest March in a period of record that dates to 1909, at 1.3°C (2.3°F) above the 1981–2010 average. The entire country had above or well-above average temperatures for the month. Parts of Northland, Waikato, Manawatu-Whanganui, and Westland were each more than 2.0°C (3.6°F) above their March average. The March temperature in the Kingdom of Bahrain tied with 1958, 1980, and 2014 as the fifth highest since records began there in 1902, at 1.7°C (3.1°F) above the 1961–1990 average. March was warm for Denmark as well, with the monthly temperature 1.7°C (3.1°F) higher than the 1961–1990 average and 0.8°C (1.4°F) higher than the average for 2001–2010. In addition, there were 11.9 frost days, which is below the 1961–1990 average of 15 days. March in Sweden was also warmer than average, with temperatures as much as 3–4°C above the 1961–1990 average in northern Värmland and Dalarna and in Lapland and Västerbotten. Norway was 3.0°C (5.4°F) warmer than its 1961–1990 average, making this one of the 12 warmest Marches since national records began in 1900. Regionally, some inner districts of Eastern Norway and Finnmark observed temperature 4–5°C (7–9°F) above average. Several mountain stations set a record for their highest maximum March temperature. In contrast, the March temperatures in France and the United Kingdom were 0.8°C (1.4°F) and 0.2°C (0.4°F) cooler than their 1981–2010 average, respectively. In the Arctic, several stations saw March temperatures well above their average, according to Meteorologisk institutt. Jan Mayen and Bear Island were the mildest stations reported here: 3.8°C (6.8°F) and 5.3°C (9.8°F) above normal, respectively. Sveagruva was the coldest station reported here, at -10.0°C (14°F) but was 6.2°C (11.2°F) above normal. Other large departures from average include: Hopen +9.3°C (+16.7°F); Svalbard Airport +8.8°C (15.8°F); and Barentsburg +8.0°C; (+14.4°F). Based on reanalyses by NCEP/NCAR, the March Arctic temperature over land for 66°–90°N overall was 3.34°C (6.01°F) higher than the 1981&dash;2010 average. This was the second highest March temperature on record for the region, 0.03°C (0.05°F) lower than the record set in 2011. El Niño conditions weakened considerably in the central and eastern Pacific Ocean during March. However, the March globally averaged sea surface temperature remained 0.81°C (1.46°F) above the 20th century monthly average, similar to February. This was the highest global ocean temperature for March in the 1880–2016 record, surpassing the previous record set in 2015 by 0.18°C (0.32°F) and tying as the sixth highest departure from average among all 1,635 months in the record. The seven highest monthly global ocean temperature departures have all occurred in the past seven months. Record high sea surface temperatures across most of the North Indian Ocean, along with parts of the central equatorial and southwest Pacific, contributed to the March warmth. Additionally, most of the eastern and central Pacific, large parts of the western and southern Atlantic, the southeastern Indian Ocean, and much of the Arctic Seas were much warmer than average. Areas with cooler or much cooler-than-average temperatures included areas to the south of Greenland in the North Atlantic and in the Southern Ocean to the southeast of South America near Antarctica, both of which have observed this pattern for up to two years. An area off the West Antarctic Peninsula was record cold. With respect to El Niño, according to NOAA's Climate Prediction Center, a transition to ENSO-neutral conditions is likely during late Northern Hemisphere spring or early summer 2016, with an increasing chance of La Niña during the second half of the year. This forecast focuses on the ocean surface temperatures between 5°N and 5°S latitude and 170°W to 120°W longitude, called the Niño 3.4 region. The first three months of 2016 were the warmest such period on record across the world's land and ocean surfaces, at 1.15°C (2.07°F) above the 20th century average of 12.3°C (54.1°F), surpassing the previous record set in 2015 by 0.28°C (0.50°F) and surpassing January-March 1998, the last time during this period a similar strength El Niño occurred, by 0.45°C (0.81°F). January–March 2016 also marks the highest deaprture from average for any three-month period on record. This record has been broken for seven consecutive months, since the July–September 2015 period. The average global sea surface temperature for the year-to-date was the highest for January–March in the 137-year period of record, at 0.82°C (1.48°F) above average, surpassing the previous records set in 2010 and 2015 by 0.21°C (0.38°F) and surpassing January–March 1998 by 0.27°C (0.49°F). The average land surface temperature was also record high, at 2.05°C (3.69°F) above average, surpassing the previous record of 2015 by 0.47°C (0.85°F) and surpassing January-March 1998 by 0.95°C (1.71°F). Record warmth was observed in various areas around the globe. An almost continuous swath of this warmth was observed from southern Africa to the North Indian Ocean to parts of southeastern Asia stretching into northern Australia. Additionally, parts of every inhabited continent and every major ocean basin had some regions with record warmth for the year-to-date. The maps below represent precipitation percent of normal (left, using a base period of 1961–1990) and precipitation percentiles (right, using the period of record) based on the GHCN dataset of land surface stations. As is typical, precipitation anomalies during March 2016 varied significantly around the world. March precipitation was notably drier than normal across various parts of South America, the southwestern United States, far northwestern Africa, and areas in eastern and southeastern Asia, and notably wetter than normal across various regions of the United States southeastern Europe, and scattered regions of central and southern Asia. Moist tropical air masses that affected New Zealand in March not only brought warm temperatures, but also significant rainfall to some parts of the country. Rainfall was more than 200 percent of the monthly normal in Nelson and Tasman. Takaka experienced its wettest March on record. Rainfall was also well above normal (>149% of March normal) in parts of Northland, the Coromandel Peninsula, western Bay of Plenty, Rotorua, Whanganui, and the west coast of the South Island. Following the wet months of January and February, March was dry in Austria, with the country receiving just 61 percent of its monthly rainfall on average. Some areas in North Tyrol over Salzburg and Upper Austria to upper Styria and to Lower Austria were particularly dry. 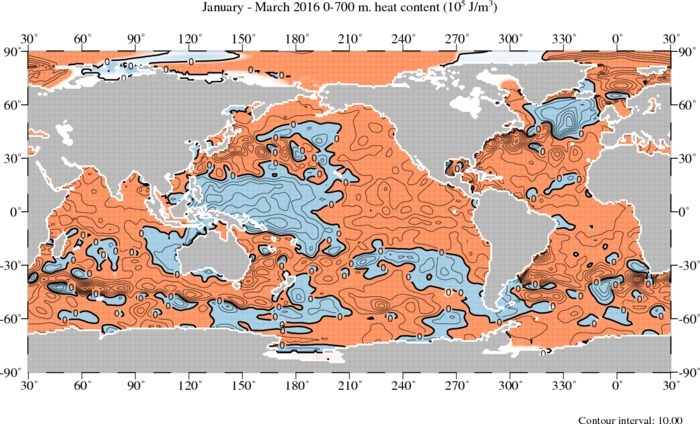 Ocean Heat Content (OHC) is essential for understanding and modeling global climate since > 90% of excess heat in the Earth's system is absorbed by the ocean. Further, expansion due to increased ocean heat contributes to sea level rise. Change in OHC is calculated from the difference of observed temperature profiles from the long-term mean. For the quarter Jan-Mar 2016, global OHC was the second highest on record, but only the eighth highest in the Pacific basin. The Pacific included areas of cooler than normal OHC in the western Central Pacific and South Eastern Pacific, consistent with the pattern of the El Niño phenomena. The subpolar North Atlantic was also cooler than the long-term mean, as well as the area west of Australia. Otherwise, OHC increased over the long-term mean for most of the rest of the global ocean. NOAA National Centers for Environmental Information, State of the Climate: Global Climate Report for March 2016, published online April 2016, retrieved on April 24, 2019 from https://www.ncdc.noaa.gov/sotc/global/201603.